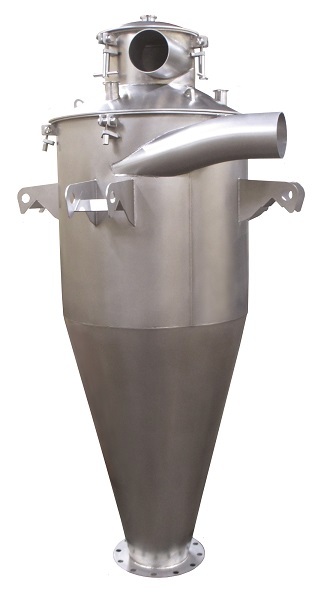 The Schenck Process Hygienic Conical Top (HCT) cyclone fulfills the requirements for use in highly sanitary applications in industries such as food, pet food, and beverage. HCT cyclones are capable of handling heavy dust loads and are good spark arrestors. Additionally, they are ideal for human/pet food applications where high moisture and high fat content are commonly used in equipment configurations that include dryers and coolers, coating drums for flavors, centrifuge exhausts, and extruder negative airlift systems. HCT cyclones incorporate sanitary design features by minimizing internal and external horizontal surfaces where product or water may collect. Sanitary, infinitely adjustable clamped connections have replaced bolted flanges. This improves installation versatility while eliminating hard to clean external harborage points. A tool-free clamped dome with a ferrule used for cleaning the riser tube and draw-through area simplifies maintenance. The cone top has three ferrules for ease of cleaning the housing and hopper region. Internal wash-down is possible with design of the riser tube dome and housing cone top. Additional cleaning may be performed through the inlet and exhaust.